magnets. 5 grid spacings, 3/8"h or 7/8"h x 12"w sizes, 10 colors, Combination damp-erase/dry-erase surface. Here is a fast and easy way to exact-size task-magnet lengths against the grid on your magnetic 365-Day timeline GrandPlanner®, Training, or Attendance-Vacation Whiteboard Systems™. Just count the printed grid cell spaces on the magnet to match the grid day cell count on the board timeline and scissor-cut it to the precise task day length.The printed gray lines on the magnet register the board grid. These magnets also register with our Square Grid and Ghost-Grid™ magnetic steel whiteboards for creating your own special timeline board systems. 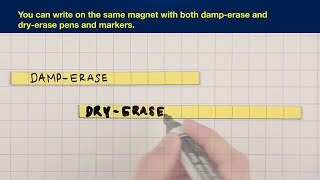 New writing surface feature: Write on the same Grid-printed magnet with both damp and dry-erase pens and markers. Use one for info that stays semi-permanent and the other for information to be changed and erased frequently.